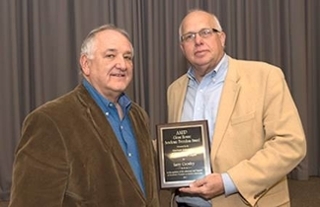 Larry Crowley, associate professor of construction in Auburn University’s Department of Civil Engineering, has received the 2015 Glenn Howze Academic Freedom Award from the Auburn chapter of the American Association of University Professors. The award represents Crowley’s high ethical standards and professionalism while providing active and ongoing support for the faculty’s role in shared university governance. Crowley is completing his term as immediate past chair of the University Senate, marking five years in senate leadership. Faculty members who participate in the University Senate are involved in the formulation and review of institutional policies that affect the academic and professional welfare of the university and faculty. The award is named for the late Glenn Howze, a leading advocate for shared governance who served as chair of the University Senate in 1998.